“The Library” includes a desk with a photo of Ron Seibert\'s wife on top and a bottle tucked in a drawer. The attention to detail in the miniatures is seen on these shelves of Ron Seibert\'s displays. Ron Seibert\'s “The Game Room” won a Best of Show blue ribbon at the Iowa State Fair in 2001. “Ron\'s Pots” is an interpretation of a potter\'s shed, complete with a throwing wheel and clay slip on the floor. 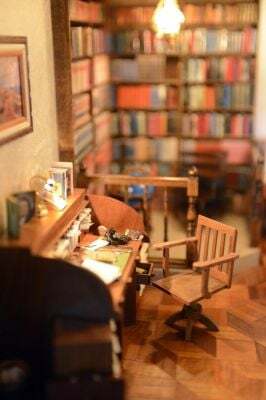 Ron Seibert created this room for display in his miniatures collection. Ron Seibert with some of the miniature rooms he constructs from scratch. One of Seibert\'s wife\'s purses ended up in the furniture covering, right. Ron Seibert with some of the miniature rooms he constructs from scratch. "The Library" includes a desk with a photo of Ron Seibert\'s wife on top and a bottle tucked in a drawer. Often asked how long it takes to make a miniature room, Seibert estimated he spent 60 hours just stitching this small rug for one of his rooms. Ron Seibert with some of the miniature rooms he constructs from scratch. This 1/12th scale room has another miniature room inset into its wall, making that inset room 1/144 scale. Ron Seibert with some of the miniature rooms he constructs from scratch. 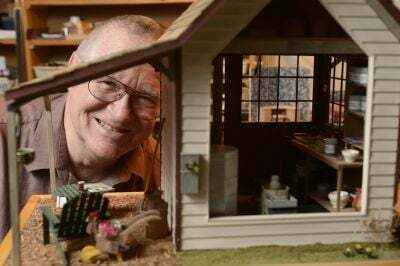 Ron Seibert with some of the miniature rooms he constructs from scratch in his basement workshop. When Ron Seibert of Racine wants to relax, he heads to his small basement workshop and builds furniture: cushy upholstered couches, painted hutches, wingback chairs — even a pool table. He has ample room to store them, too, because the furniture doesn’t take up much space. In fact, it fits in the palm of his hand. Ron is a miniatures hobbyist, and his creations are not toys but finely crafted treasures. Ron eventually sold the trains. But then the woman who cut his hair told him about her mother-in-law, a miniatures wholesaler. “I visited her mother-in-law … and jumped in feet first,” he says. Thirty years later, Ron has completed more than 60 projects and built about 270 pieces of furniture. He also makes kits for presentations to the Milwaukee chapter of the National Association of Miniature Enthusiasts. The nonprofit, educational organization has 234 charter clubs across the country and some 5,000 members, according to Kim Ash, manager of NAME’s central office in Carmel, Ind. “Our members are a little bit of everything,” she says, including collectors, retailers and do-it-yourselfers. Some, like Ron, specialize in building furniture; some design miniature food. One member, a silversmith, works only in silver. The Milwaukee chapter is comprised of 14 women and Ron. “There are a lot of men who are part of our organization,” Kim says, but they are in the minority. Maybe it’s because so many women grow up playing with dollhouses — or wish they had. Ron was fascinated because he could build things with wood. A former math teacher and school principal, he sees himself as a technician. “I look at a picture in a magazine and decide, ‘I’m going to build this.’ I can’t count how many times I’ve done that,” he says. Amazingly, he rarely works with a pattern but relies on his “math head.” To fashion a miniature recliner, he just looked at those in his living room. “Sometimes I goof and have to throw it away,” he says, but half the fun is in the trying. Although his furniture is typical dollhouse size (1:12 scale), Ron has no interest in dollhouses. Instead, he painstakingly handcrafts individual rooms, storefronts and scenes — including a clever “redneck trailer” — in wooden display boxes. Lucky friends and relatives who get to see his basement “gallery” can spend hours checking out the fun details that accent his precise displays: tiny cardboard books, teeny drawer pulls on working drawers, a handmade hooked rug. Ron, who’s also interested in genealogy, even shrinks family photos to fit in little frames. His intricate game room — with the pool table, a bar, table and chairs, and handmade cue sticks — won him a Best in Show ribbon at the Iowa State Fair. Some projects are reproductions of actual rooms or a variation on a pattern in a magazine. Sometimes an idea just springs to mind. “When I did my library, I could just see it in my head,” he says. Ron often builds furniture without a room in mind, storing the pieces for future use in a basement cabinet. One leather-look couch and chair, still waiting for a home, he “upholstered” using his wife’s old purse. While some might find the exacting nature of his hobby tedious or frustrating, he finds it calming. “I could come home from school, very uptight, and I’d come down here to my workshop,” says Ron, who retired in 2008 from St. John’s Lutheran School. On his worktable, steel weights hold pieces of a chair in place as they dry. Other tools of the trade include mini clips, a variety of tweezers, little scissors called “squeezers” with ½-inch-long blades, his indispensable table saw and a spring-style clothespin or two. He builds his furniture — some from kits, most from scratch — using basswood and occasionally cherry, mahogany or walnut. “That’s my biggest expense,” he says, figuring he has spent about $1,200 on wood over 30 years (about $40 a year). He has done a little consignment work, but selling his miniatures and displays doesn’t appeal to him. Ron’s content just relaxing and building in his basement.